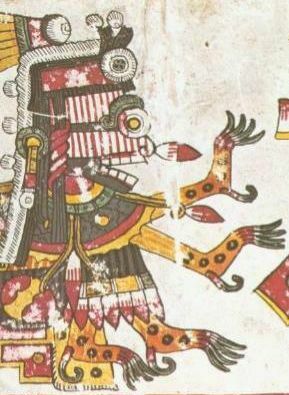 ITZPAPALOTL (pronounced its-pah-pah-LO-tl) is the Aztec Goddess of fire. Her name means either "obsidian butterfly" or "clawed butterfly", which may refer to the fact that she is sometimes depicted with bat wings. Her wings are made from obsidian, a black stone that was used for knives. Itzpapalotl rules over Tamoanchan, a paradise where the first humans were created, and where the souls of stillborn babies and women who died in childbirth went.